Found 2 file extension associations related to Redneck Rampage and 2 file formats developed specifically for use with Redneck Rampage. 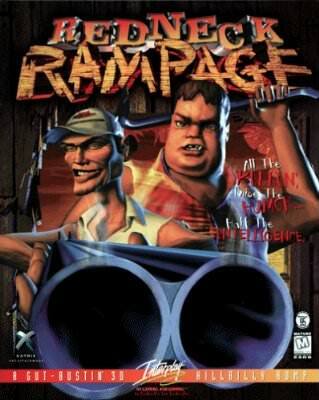 Redneck Rampage is a 1997 first-person shooter game designed by Xatrix Entertainment and published by Interplay. This game features some songs by Mojo Nixon, Reverend Horton Heat, Beat Farmers and other Psychobilly artists. As the name implies, Redneck Rampage has many hillbilly elements in it. The game was followed by Redneck Rampage Rides Again, Redneck Rampage: Suckin' Grits on Route 66 and Redneck Deer Huntin'. The plot revolves around two brothers, Leonard and Bubba, fighting through the fictional town of Hickston, USA (though the game is supposedly set in Arkansas, the highway signs in the first level of the first episode refer to Interstate 20 which are in northwestern Louisiana), to rescue their prized pig Bessie and thwart an alien invasion. The brothers battle through such locales as a meat packing plant and a trailer park, and battle evil clones of their neighbors with weapons ranging from the traditional shotgun, to a gun that fires circular sawblades, to a crossbow that fires bolts with dynamite strapped to them. Another favorite was the .454 Casull revolver. An add-on to the game was the "Cuss Pack" which added stronger language to the game's audio. The add-on was available for download at Interplay's online store, but users had to pay $1 with a credit card to ensure that the buyer of the add-on was of adult age. The add-on was included on the CD for the Mac OS version. The Redneck Rampage software seems to be old or discontinued. If you need more information please contact the developers of Redneck Rampage (Interplay Entertainment Corporation), or check out their product website.